You may have heard about augmented reality before. If you haven’t, you’ll be hearing a lot about it from now on, with the smartphone and tablet revolution now in full-swing. Augmented reality (AR) is a term used to describe a live view of a physical, real-world environment that is augmented by computer-generated sensory input, such as sound or graphics. 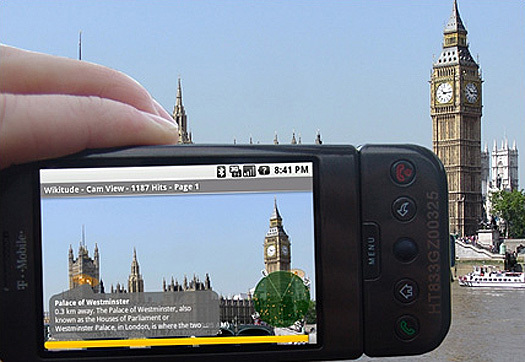 A typical AR environment has digital information transposed onto a real-world view. AR is not to be confused with virtual reality (VR), which is an entirely digital experience that mimics real-world situations. There have been countless notable examples lately of augmented reality in action. It has only been in the last few years that brands have really started to tap into the potential of AR technology, and we reported on this back in December in our retrospective of 2010’s most memorable AR marketing case studies. This post is well worth a revisit to get a flavor of how businesses are harnessing AR tools to really take their advertising to the next level. That’s augmented reality in a nutshell. As with any burgeoning technology, before we really look at where we’re at and where we’re going, it can be useful to take a quick look back at the path it has taken to where it is today. And if you’re completely new to this area, it’s also a good way to familiarize yourself with something that you’ll be seeing a lot more of in the months and years ahead. So without any further ado, here’s a look at augmented reality: past, present and future. As with many technologies, hitting a definitive moment when augmented reality was born isn’t easy. For example, way back in 1961, cinematographer Morton Heilig patented his Sensorama machine, an immersive multi-sensory device that looked like a giant arcade game, except it emitted aromas, environmental elements such as wind and it also vibrated and played stereo sounds. Whilst some have referred to this as the earliest example of augmented reality, it probably leans more towards the virtual reality world. Moving forward, computer artist Myron Krueger built what was called an ‘artificial reality’ laboratory called the Videoplace, in 1974. The Videoplace combined projectors, video cameras and special purpose hardware, and onscreen silhouettes of the users, placing them within an interactive environment. Whilst augmented reality as a concept had been brewing for some time, it was Professor Thoma P. Caudell, then a researcher at Boeing, who first coined the term ‘augmented reality’ in 1990. He was referring to a head-mounted digital display that guided workers through assembling electrical wires in aircrafts. AR as a concept started to take off during the 90s, and the development of virtual fixtures in 1992 is widely considered as one of the first properly functioning AR systems. There are, of course, some gaps in the potted history of augmented reality provided above. Countless academics, scientists and geeks have helped us get to where we are today, and those that dared to dream have taken us to places that once existed only in sci-fi movies. There are literally hundreds of examples of very cool augmented reality apps, tools and innovations out there. It would be easy to link through to the cream of the crop and simply say “wow, aren’t these awesome?”, but this ‘wow’ factor can only last so long before you have to take a step back and consider what their actual functions are. Doing cool things with technology certainly gets folks’ attention, but creating something genuinely useful from AR is another issue altogether. It is pretty cool, and at around two bucks to download, it will hardly break the bank. The game uses GPS, and you need a large open space to play the game, so there’s a danger that you’ll physically crash into something or tumble off the edge of somewhere steep. Plus the game ultimately suffers from the ‘novelty’ factor. There’s a lot going on in augmented reality right now, and it’s becoming a crowded space. I spoke with Rish Mitra, co-founder and CEO of Blippar, to get his thoughts on where we’re currently at in the augmented reality space. It’s probably also worth stressing that Blippar was planned and researched for a year and a half, and the actual development of the app was only a few months. Such an approach will probably prove pivotal to the success of many AR tools, with more focus placed on the research and planning phase, rather than a rush to get something ‘cool’ to market. To get a real sense of where we are with augmented reality, it’s perhaps worth looking to some of the market leading AR companies. And two weeks ago, Total Immersion released TryLive, a potentially game-changing AR application aimed at online clothing and accessory retailers. Whilst people have been shopping for clothes online for years, there really is no substitute for trying before buying. Any device equipped with a camera can tap into the various TryLive applications which essentially bridge the gap between viewing and trying on the product by acting as a virtual showroom. Okay, it won’t help you test for the fit, but it will give you an idea of how you’ll look in something. Companies such as Total Immersion are helping to set the AR expectation levels. Augmented reality has to show that it can cut it as a longer term commercially viable technology. Another company that is doing pretty groundbreaking stuff in the AR sphere is CrowdOptic, a real-time crowd behavior monitoring tool underpinned by augmented reality technology. CrowdOptic lets fans at events such as concerts and sporting fixtures point their smartphones at an athlete or performer and view real-time information about the target, such as coaching insights and stats, and also receive exclusive invitations, ticket discounts, marketing promotions and more. For example, if you’re at a concert or football match you might point your phone’s camera at the action. If a few hundred other spectators do the same thing, using triangulation and GPS data, CrowdOptic detects where the crowd’s attention is at any given moment, relaying the data back to the event’s organizers. By knowing what is being photographed or videoed, this gives the organizers a mechanism for monetizing these insights in real-time during the live event. The results from this technology reveal a new way of understanding what crowds are focusing on which – in time – could well change the nature of live event broadcasting. This offers something different to the countless cutesy AR apps that are doing the rounds and sets a benchmark for what could be a massive advance not only for augmented reality, but geo-location technology too. It seems that AR is currently pretty good with static objects and all things ‘known’. The next big step for augmented reality – something that CrowdOptic is moving towards – is to focus on ‘moving’ and ‘unknown’ targets. For example, it may soon be possible when you’re watching the marathon to hold up your smartphone and track how fast they’re running with real-time stats. And this gives us a glimpse into possible future uses of AR technology. So when will this happen? Mitra says that social acceptance of the idea needs to be there first. The route in, it seems, will be through a typically early-adopting crowd – the gaming community – before it becomes a mass market product. Whilst the ability to enjoy AR experiences simultaneously and collaboratively may help bring the technology mainstream, it will also help if the power of augmented reality technology is broadened to be made accessible to as many people as possible. There are countless tools and platforms these days that enable non-techie people to build pretty comprehensive and functional websites. If this can be replicated in the AR sphere, then we could see its uptake grow exponentially. We wrote about Poistr back in March, and this could be the type of tool to do just that. Poistr enables non-developers to create elements and points of interests that are viewable using the Layar app, one of the most popular augmented reality browsers. Poistr is still in beta mode, and it’s currently free to use, but it could be a sign of things to come as AR technology is gradually opened up to the masses. Augmented reality at present still largely feels as though it’s finding its feet, finding a niche and, ultimately, finding a purpose. But there are clear signs of the direction in which it’s heading. Meanwhile, if you want to follow what’s happening in this field of technology, why not read our recent post outlining the 25 most influential people tweeting about augmented reality.